For the fifth straight week, Oklahoma women's gymnastics is the No. 1 team in the national rankings, holding a regional qualifying score (RQS) of 197.765. 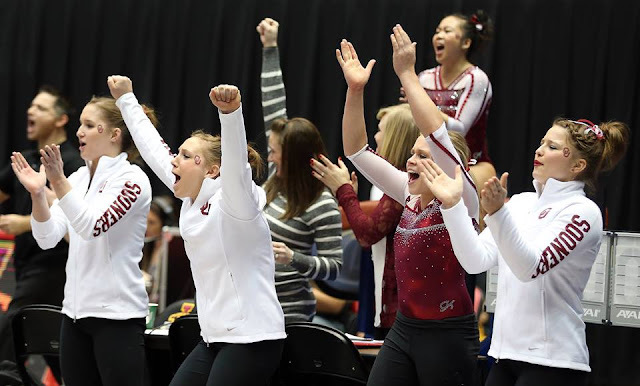 The Sooners used a 197.775 performance, their fourth-best team total of the season, in a win over then-No. 18 Arizona to boost their RQS from last week's total of 197.705. Florida stayed in the No. 2 spot in this week's standings with a RQS of 197.580, while the rest of the top five saw movement with LSU ranked in third place (197.340), Alabama in fourth (197.325) and Utah in fifth (197.105). RQS is based on a team's six best regular season scores, three of which must be away. The overall high score is eliminated, and the five remaining scores are averaged. RQS scores are used to determine seeding for regional competition at six campus sites on April 2. The Sooners hold five additional first-place rankings, two on team events and three individually. As a team, OU used a program-best 49.675 on bars in last Friday's meet to stay first on the apparatus for the fifth straight week with a RQS of 49.530. For the third consecutive week, the Sooners are also ranked in the top spot on floor with a 49.530. Additionally, OU is ranked third on vault with a RQS of 49.395 and second on beam (49.370). Eight Sooners hold a total of 16 individual top-25 rankings, the second-most in the nation. Junior Chayse Capps is ranked in the all-around and on all four events, sitting in first place in both the all-around (39.620 RQS) and on beam (9.940, tied for first with Danusia Francis of UCLA). This marks the third straight week Capps has the highest mark in the all-around and the fifth she has been ranked No. 1 on beam. Capps is also tied for 20th on vault (9.875), shares fourth on bars (9.915) in her first season competing on the event and checks in tied for 21st on floor (9.900). Also ranked No. 1 is junior McKenzie Wofford, whose RQS of 9.945 has her in the top spot on bars for the ninth consecutive week. Senior Keeley Kmieciak is ranked 11th in the all-around this week with a 39.450 RQS. She is tied with Capps and freshman Nicole Lehrmann for fourth place on bars (9.915). On vault, sophomore AJ Jackson remained second (9.935), senior Haley Scaman is tied for 14th (9.890) and junior Charity Jones shares 20th place (9.875). The trio is also ranked on floor, with Scaman checking in tied for sixth (9.930), Jackson sharing 15th (9.910) and Jones holding a share of 25th (9.895). On beam, sophomore Natalie Brown sits in a tie for seventh place with a 9.900 RQS. Next up, the Sooners (19-1 overall) hit the road to close the regular season at No. 8 UCLA. The meet is scheduled to begin at 4 p.m. CT on Sunday, March 13, in Los Angeles, Calif., and will air on the Pac-12 Networks.